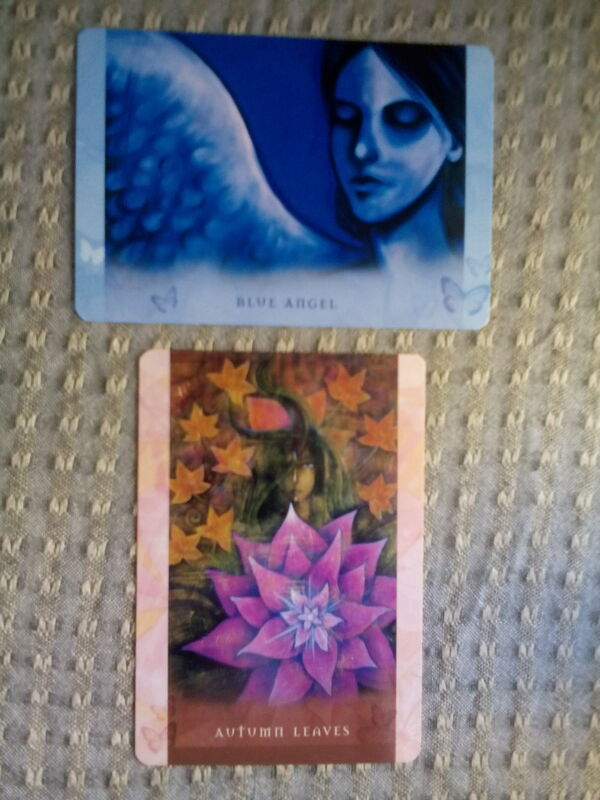 Autumn Leaves and Blue Angel, from Toni Carmine Salerno’s Universal Wisdom deck. “Nooooooo! Not Mercury retrograde! AGAIN! !” Yes, Mercury retrograde. And yes, it’s a big, intense one. Officially starting on Saturday, but as you may have noticed, it’s been here for a couple of weeks now, at least. Maybe a month! Sometimes it seems as though the shadow period before Mercury retrograde gets bigger and longer in proportion to how massive and intense a time is coming. And this one…personally, I’ve been having electrical and technological problems for months. One day I had to go outside and ground by putting my feet in the grass because it felt so electric around here. And I recommend that you do the same if it gets too overwhelming. There is nothing like the relief of putting your bare feet on the Earth. But. That said. I wouldn’t trade Mercury retrograde for anything. Granted, I tend to like the shadow sides of things. I love cold weather and darkness. I loved living in Alaska during the time of the year when it is almost never light — that same time of year that drives many Alaskans to drink and/or develop a lack of light depression. I love Halloween (it’s the only holiday I do like!). And I love those tarot cards that are supposedly negative: the Tower, Death, the Hanged Man, the Moon. All favorites of mine. Yes, they are. But those are the moments that transform us. I would much rather get swept away in a tidal wave of transformation than stay mired and stuck in samsaric muck and mud. Moreover, we are watched over during these times. Have faith that it will all work out. What will manifest next will be exactly what we need (in some way, even if it’s aggravating and/or painful to begin with), and meanwhile, we have angels protecting us. Drawing from Toni Carmine Salerno’s Universal Wisdom deck today, I drew “Autumn Leaves” and the “Blue Angel” — Archangel Michael. Yes, it’s that time of the year. It’s autumn, the leaves are falling, things are dying, Halloween is coming, and now we have Mercury retrograde to deal with on top of that, and an intense one too. But these things happen for a reason. The Wheel has to turn. We’d be SOOOOO bored and stuck if it didn’t! And we are, truly, fundamentally safe, even in the moment of our deaths. Even in our Tower moments. Even, for that matter, in our Three of Swords moments. Bring it on. Let’s see what comes next!! I, for one, am excited. And I challenge you to get excited about this time of year too.